The Gunpowder Plot – What Price Peace? The TV crew is outside the Minster and I am tempted to watch it – a sort of distant bystander – rather than concentrate on the structure of my next book. 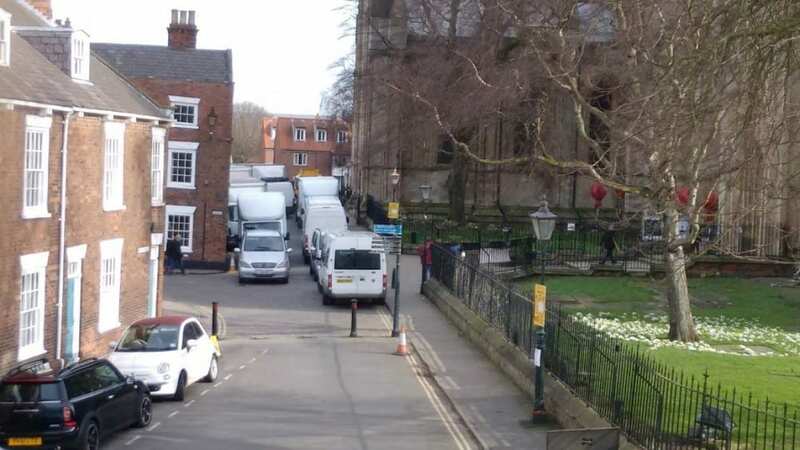 Others gather on the pavement hoping to glimpse a famous actor, bewigged and booted, before he strides through the hooped cotton tunnel between the changing van and the side entrance to the Minster, closed for this week. Is the Minster standing in for the Houses of Parliament in 1605? Did the conspirators slink along the walls facing Highgate that leads to the main entrance, now firmly closed? At dusk yesterday, about 5 in the afternoon, I noticed the red hoods were off the powerful lights in each bay now flooding the sandstone blocks and sparkling the colours in the stained glass windows above. Although there has been an attempt in recent years to tone down Bonfire Night on the Fifth of November ‘Gunpowder, Treason and…’ because of fire risks, it’s said. Or political correctness? There used to be parties round bonfires of autumn garden debris and fireworks for the children as dusk came early before bedtime, and even apple dunking and potatoes and sausages cooked on the embers, and… There were knocks on the door with requests from a group of, usually, little boys with a wheelbarrow and a ‘guy’ made out of straw stuffing a father’s cast-off clothes below a cut-out turnip face. ‘Guy’ in remembrance of Guy Fawkes, the plotter who was caught red-handed, allegedly on the way to light the gunpowder and blow up the Houses of Parliament while King James I was opening a session. It was a northern plot by Roman Catholics, and centuries later a descendent of the Fawkes family welcomed me with a group into his property. Turner had painted some small watercolour landscapes for his Fawkes ancestor when touring Yorkshire. They hung on the walls of a later 18th-century addition to the 17th-century Jacobean house, forming an L-shaped building set peacefully in low hillsides of fields and woodland. The 1605 Gunpowder Pilot may provide us with a dramatic and enthralling television series.However, was it the precursor of the last bloody conflict, family against family, in the British Isles – the Civil War, Royalists against Parliamentarians, with the losers, the Parliamentarians, winning in the long run by laying the foundations for parliamentary democracy worldwide?